age of 30, in 1880. Send these, the homeless, tempest-tost to me." So the words of Emma Lazarus affixed to a plaque on the Statue of Liberty. And yet there is opposition in Europe to accepting these refugees. The burden on the State, the cost of assimilation--all these factors. But there is also the perennial fear of the other, the one who is not like me, who does not look like me, who does not smell like me, who is not me: that surely is part of the opposition. And that opposition was seen in this country as well in the waves of Irish immigration in the nineteenth century, which exposed the basic anti-Catholic soul of this country. And then the waves of Italian and German and Polish immigrants who did not speak the language and who stubbornly kept their European heritage in this country including, in many cases, their Catholic faith. The great melting pot was never a reality in this country, and thanks be to God it was not, because grey sludge is never attractive. And yet, sludge is what we have become, not the melting pot of cultures, but rather the sludge of a secular society ruled by the Brahmins whose power is based in the selfish individualism of this society and who call themselves liberals, which term actually means those who believe in and understand what freedom means. The irony is too deep for comment. And yet part of the opposition to this wave of immigration is the fear this will result in the de-Christianization of Europe and of the West in general. This opposition would seem to be futile and silly, for the de-Christianization of Europe is in many ways already a fait-accompli. The deeply cynical attitude of the German Catholic bishops and their clergy in general—who by the way earn more than many middle class American do—is evidence of the parlous state of Christianity in Europe. At least the Italians have better museums and better food, even if many of their bishops march in goosestep to the nonsense of the post-Vatican II denial of reality. The de-Christianization of Britain is nearly complete despite the beauty of Salisbury Cathedral and the men and boys choirs of the colleges of Oxford and Cambridge, where the Church of England exists only because it is supported by the money of the government and the Crown. There are few here who love European culture more than I do, but the culture that produced the great art and sculpture and music and architecture had Christianity at its heart, and that culture no longer exists. So the New York Times speaks in behalf of accepting these refugees on the basis of humanitarian grounds. What is the basis of this humanitarianism, especially in a culture like ours? Is it a form of noblesse oblige? Is it a form of limousine liberalism—bring them into the city but nowhere near me on the Upper East Side? Is it a faint recalling of the words of the Jewish prophets and of Christ that still somehow echo in our society? But more to the point for us: what is the Catholic response to this pressing and tragic situation? The response must be one of love of course; it cannot be one of rejection based on prejudice and fear. Jesus sat down at dinner with all sorts of people, including the Pharisees with whom he had deep problems. He allowed a known prostitute to anoint his head and feet at a dinner party hosted by religious leaders. But every such encounter, every such sitting down with sinners, especially religious sinners, was an encounter in teaching, in witnessing, in pointing to that love of God that is the definition and essence of God who alone can fulfill the longings of man both religious and secular. And it is this that must be the basis of the response to the refugees fleeing war and hunger and seeking asylum and a new life. The basis of the response of the Christian is the person of Jesus Christ, who is the way, the truth and the life. Lest you think that this is a retreat in to mere piety, remember some of Jesus’ parables about the practicality of what it means to be a Christian: if an army is marching against you with more soldiers than you have, figure out in a practical way if there is a real possibility of prevailing against this army, and if not, break a deal with the opposing king until you can regroup and figure out how to win the battle. Practicality and prudence are needed in this situation. There is no question that it is wrong to ignore immigration laws and procedures for citizenship. Every country has the right and duty to secure its borders. Love has nothing to do with chaos. But in these matters, be as wise as a serpent and gentle as a dove. At this point I recall one of my hero saints, Mother Cabrini, who ministered to the immigrant Italian population not only in the squalor of lower Manhattan a hundred years ago but also in San Francisco and Denver and Argentina. 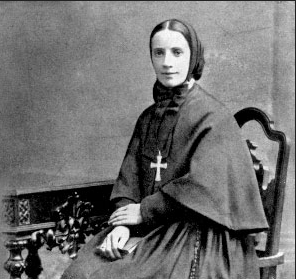 This was a mulier fortis, a woman of faith, who knew how to get things done both in the Church and in the world and who was the instrument of Christ in keeping so many souls in the bosom of the Catholic Church and the grace of her sacraments. Yes, let us accept those who flee the horrors of war, of oppression and of hunger. But let us do so openly in the name of the Lord of heaven and earth, the almighty Father, and in the name of his only begotten Son whose death on the Cross is the proof and exemplar of what love is, and in the power of the Holy Spirit without whom there is no grace in this world. This welcome to these refugees must come from love, that is the basis. But we have an obligation as well to let them know where this love comes from. It is not in some touchy feely understanding of obligation to others, nor to a secular humanist understanding of obligation to others that has no objective basis other than a weak echo of a Judaeo-Christian understanding of obligation to love the other, especially the poor, and poor in every sense. The current crisis in the deepest sense in all of its manifestations provides an opportunity to do what has to be done: to preach Christ crucified and to live a life that shows forth that love shown forth on the Cross of Christ. Yes, let us welcome the refugee among us, but let us not forget that this is an opportunity to evangelize. Yes, to feed the body, to clothe the body, to allay basic fears of hunger and safety, but above all to bring the saving Good News of God in Jesus Christ to those to whom we minister. And this not by slamming them over the head with doctrine and dogma. But most of all by being with them, loving them, so that they see in us something precious that they do not have and desperately want. In this we must be Marian, we must like Mary point away from ourselves to her Son, who alone can be the source of our light and our hope. May God give each of us the faith and courage and love to do what has to be done.